FLINT, MI – More than $10,000 in donations from 14 companies will help an after-school program at Flint’s Holmes STEM Academy purchase curriculum and go on field trips. 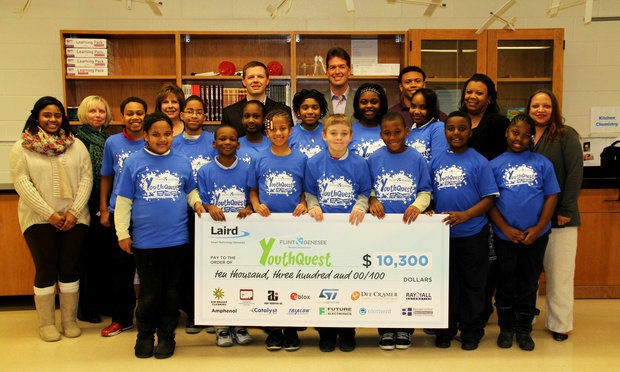 A $10,300 donation from technology company Laird was made on Wednesday, Dec. 10, to YouthQuest, according to a statement. Laird made a $5,000 donation and then challenged its suppliers to match its donation. Gifts came in from U-Blox, Mid Star Sales, Raydiall, Catalyst Sales, Benskin & Hott, Trialon Corp., Albar Industries Inc., Future Electronics, Element, CHMP Inc., Dee Cramer, Aim Bright Cleaning and Ammphenol, the statement said. The Flint & Genesee Chamber of Commerce sponsor YouthQuest reinforces learning that takes place during the school day by offering activities and services that encourage the exploration in the areas of STEM and the arts, and promotes academic achievement, physical fitness, youth leadership and volunteerism. Laird employs about 9,000 people in operations in North America, Europe and across Asia. It has local facilities in Holly and is headquartered in London.